‘Last night I saw something amazing. I saw a man from among my Ummah to whom the Angel of death came to seize his soul, but his honoring of his parents came and kept the Angel of death away from him. ‘I saw a man whose torment of the grave was about to come upon him, and his wudu (ablution before prayers) came and saved him from that. ‘I saw a man from my Ummah whom the devils had seized, but his remembrance of Allah came and banished the devils from him. ‘I saw a man from my Ummah whom the Angels of torment had seized, but his prayer came and saved him from them. ‘I saw a man from my Ummah tormented by thirst. Every time he approached the cistern, he was pushed back, then his Ramadan fasting came and gave him to drink and quenched his thirst. ‘I saw a man from my Ummah, and I saw the Prophets sitting in circles. Every time he approached a circle he was repulsed, then his doing ghusl (full ablution) to cleanse himself from janaabah (impurity) came, took him by the hand and brought him to sit beside me. ‘I saw a man from my Ummah in front of whom was darkness, behind him was darkness, to his right was darkness,to his left was darkness and above and beneath him was darkness. He was stumbling in darkness; then his Hajj and Umrah came and brought him out from that darkness into the light. ‘I saw a man from among my Ummah trying to protect himself with his hands from the flames and sparks of Fire, then his sadaqah (giving in charity) came and formed a barrier between him and the fire and shielded him. ‘I saw a man from my Ummah speaking to believers but they did not speak to him. Then his upholding of family ties came and said: “O Muslims he used to uphold ties of kinship so speak to him.” then the believers spoke to him and shook hands with him and he with them. ‘I saw a man from among my Ummah whom the guards of Hell had seized, then his enjoining of what was good and forbidding of what was evil came and seized him from them, and brought him to be with the Angels of mercy. ‘I saw man from among my Ummah kneeling down, with a screen between him and Allah. Then his good manners and attitude (adab) came and took him by the hand and brought him before Allah. ‘I saw a man from among my Ummah teetering at the edge of Hell, but his hope in Allah came and saved him from that and he moved on. – A hadith (saying) of the Prophet (pbuh) narrated by Abdur Rahmaan ibn Samurah. Note: See also this poem. In December of 1986, I was operated on to remove my pituitary gland and the small benign tumor within it that had resulted in Cushing’s Disease, and had caused a lengthy hospital stay in the beginning of that year. It was during that earlier hospital stay that I had the out-of-body experience I have written about in a previous post (which you can read here). An instant that lasts for eternity! In the years since those two events, and as I approach my sixty-fifth birthday, death itself holds no fear for me, because just as in the Angel of Death excerpt from Master of the Jinn, I really do consider it a mercy from God. But I cannot but wonder if one of those experiences holds the answer to the great mystery of what comes afterward. Both possessed the immediacy of experiential truth, but can both be real? Is the instant of nothingness a precursor to awaking on a different plane of existence? Can it be that our spirit, or soul, or ka, or whatever your faith calls it, leaves the physical body at death and after an instant of blankness, joins, or rejoins, the Eternal Godhead? My late father-in-law believed the former. Once I asked him if he thought that we live on after death. He said, “Yes, in blood and memory.” In other words, we live on in the bloodline passed to our children and grandchildren and down the generations. And in the memory they carry of us, until that is lost in time, when those that still remember us have also died. He considered himself a realist. And yet, the first law of thermodynamics, an expression of the principle of the conservation of energy, states that energy can be transformed (changed from one form to another), but cannot be created or destroyed. Is that also true of the energy of consciousness, which is, after all, the only part of us that really would go on after the body dies? Or is it just our greater Self that goes on, our soul, which is that ineffable part of us that is always in touch with, and originally a part of, the Oneness of Divine Love? Inshallah, it is so. I do not mind at all leaving the lesser self behind; the individual ego with its fears and jealousy and enmity and regrets. Let it die as the electro-chemical brain and body functions come to a stop. I know that love goes on. And after years on the Sufi path, I have seen what can only be described as a glimpse of… something other. There is some comfort in the belief that the body is nothing but a shell for the evolution of consciousness, “to evolve toward the Godhead,” as Pierre Teilhard de Chardin, the French philosopher and Jesuit priest wrote in The Phenomenon of Man. And, so as not to waste what God has given, I am also an organ donor; I prefer to leave all organs that are still of any use to help others, and the rest to be cremated. I like the efficiency of the fire, taking up as little room at the end as I did at the beginning. And I like the idea of my ashes scattered to the winds of the world. There is hope in that statement. I have studied many religions and their beliefs of the afterlife, and in all honesty they sound mainly the same, a heavenly paradise where the individual self consciousness, and often the resurrected body, is kept intact and rewarded or punished for its life on earth in just measure to its deeds. But if the individual self stops at the end of life, the afterlife must be something else entirely. What that something else, that wetness is, is one of the eternal questions of living beings. The ultimate mystery! And that’s what I’m counting on :) All questions are inevitably useless. The answer will come soon enough! No mythology and metaphor for me. I want the great mystery, all of it, no matter what it is—a billion years in the blink of an eye, or an infinite panorama as vast as the universe; and an endless sea of stars on which to sail. Death is an angel with two faces; to us he turns a face of terror, blighting all things fair; the other burns with glory of the stars, and love is there. Blessed are the humble: for they shall inherit the earth. shall say all manner of evil against you falsely, for my sake. The Beatitudes of the Sermon on the Mount, spoken by Jesus, the son of Mary (Isa ibn Mariyam). April is for Library Lovers! 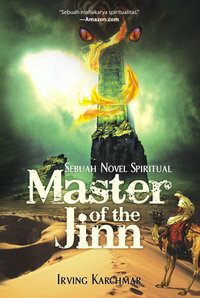 April 11-17 is National Library Week in the US, and April is also School Library Month, so please consider buying a copy of Master of the Jinn to donate to your public or school library. You are currently browsing the Darvish blog archives for April, 2010.